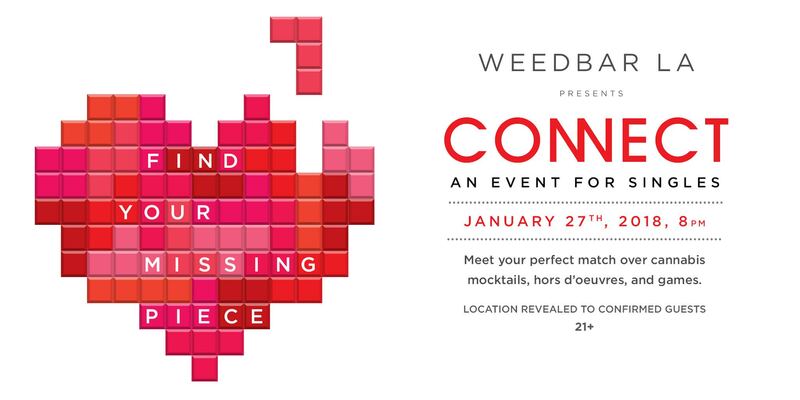 On Saturday, January 27th, 2018, WeedBarLA presents CONNECT: A Singles Mixer. Gay or straight, being alone on Valentine’s Day is never fun, so start the new year by meeting someone great. If you’re tired of the noisy bar scene, impersonal dating apps, or your mom's blind date -- then CONNECT is just for you. With fun games, delicious h’dourves, and cannabis mocktails, it's the perfect place to meet that special someone who shares your same interests. Anyone over the age of 21 is welcome to partake in what is sure to be an unforgettable evening!